ok.. i confess, i have not been "around" here lately, as family L.I.F.E seems to completely comsume me (yah, that'd be mothering twins & a chattery 5year old).. i mean, i'm on a jet plane as opposed to a low steam engine, & I never come down! it's whisking away my yarn making time too, which is why i have decided to chill out until next year with etsy store listings.. this makes me feel a whole lot more relaxed about getting back on the horse so to speak. YUP. that's right, none, nada, nilla, zilch from la Wooldancer for the last month (or more, not for lack of yarn enthusiasm no.. just daily round of travelling 2hours a day to school & back, twins, sweet twins etc..) & it was starting to look like that for the rest of the year too, so i'm taking the pressure off myself, & devoting this christmas holiday to my children & family, with hope of returning with renewed vigour & refreshed approach in the New Year *-* BRING IT ON I SAY!! Having said that, i did fit in some rather pressing skeins this last week.. been having loads of fun (of an evening when all is quiet) with Mr Smith, aka drum carder. 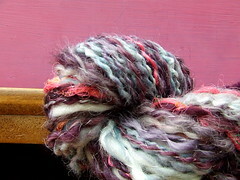 SUGAR is *so* sweet, a self-striping handdyed, handcarded candy pink & lime merino, white oh so soft merino spun with icicle tufts, pearlescent sequins & sari silk accents all plied with silver shimmer thread to boot!! WOO.. & it definately suits it's gift recipient! SNOWQUEEN is melt in your mouth divine up close.. she sparkles!! 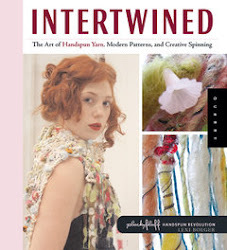 made with a melody of fibers, namely merino & english lester locks of long-haired goodness, ingeo, icicle, sari silk, she will self pattern too, woohoo!! i am LOVING the shimmer silver thread for plying, can't you just tell!! i think it will be very appreciated by it's recipient also!! 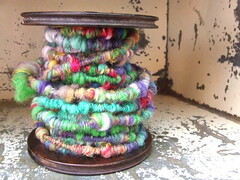 Love the coils...so fun!! Enjoy the time off during the holidays! ditto!! 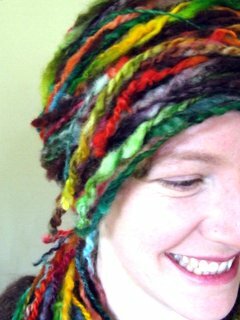 thank you Naomi..im so lovin those coils.. *so* fun.. & warm to wear all wrapped around.. perfect for these craZy chilled summer days we are having here on the mountain! !